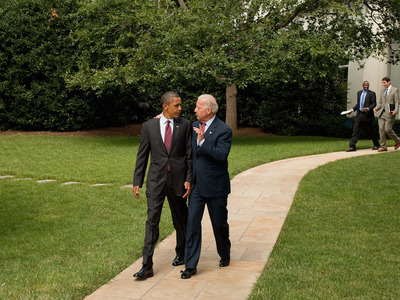 White House/Pete SouzaPresident Barack Obama and Vice President Joe Biden walk from the Oval Office to the motorcade on the South Lawn driveway, July 21, 2010. Research has shown that walking is one of the best things you can do to counter the effects of sitting all day. A new study conducted by the University of Miami published Thursday in the journal Preventing Chronic Disease took that concept one step further. The researchers found that replacing one regular meeting a week with a walking meeting increased the amount of high intensity physical activity happening in a week by 10 minutes. This suggested that the walking meetings were having a positive impact on the worker’s health. The small pilot study only looked at 17 people who worked at the university in office jobs. The participants were given accelerometers to track how fast they were moving over time. In the first week of the experiment, the participants were asked to go about their week the way they normally would. For the second two weeks, they were asked to set up a 30-minute walking meeting once a week with the other members of the study. Some said they were more focused on the meeting itself, since they couldn’t be on their computer working on other tasks. The walking meetings kept their agendas on track, and the meeting ran efficiently. Some used it as a way to de-stress during the busy day. The meetings were easy to add to work routines, suggesting that it wouldn’t be too difficult to apply this to a larger group. Although the study was relatively small, the researchers pointed out some ways to expand. They recommended that future studies increase the number of walking meetings per week and that they look at the effects on a larger number of participants.